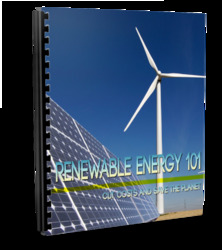 The growth of offshore renewable energy generation is the biggest expansion of development in the marine environment in recent years, with offshore wind farms at the forefront of this. Due to its favourable wind resource, Europe in particular is rapidly expanding its portfolio of offshore wind energy generation; however, the rest of the world is also beginning to take advantage of this natural resource. This is due, in part, to the fact that Europe, especially the north-west region, has ideal conditions for development, due to the high offshore wind levels, and the fact that its coasts slope gently away from the land. This means that water depths increase relatively slowly in most areas, making conditions highly suitable for offshore construction (Ackermann and Soder, 2002). In addition to this, the offshore wind environment is much more reliable than onshore wind, as it is less turbulent, and has a higher energy density. This is due to the convection caused by the differential heating and cooling of the land and sea over the daily cycle, making the offshore zone generally windier. Further offshore, the lack of surface roughness adds to average wind speeds, further increasing energy efficiency. It is estimated that an offshore wind farm can generate around 50% more electricity than can be generated from an equivalent sized land-based development (Linley et al., 2007). In the UK, the development of offshore wind energy generation has been undertaken in a series of Rounds. In April 2001, following a detailed consultation and application process, eighteen 'Round 1' sites were announced, with a maximum of 30 turbines (BWEA, 2005). Whilst these projects were in the planning stages, further consultation was undertaken, discussing topics which would be critical to future development, such as the consents process, legal frameworks and the electrical infrastructure required for future projects. Three Strategic Areas in UK waters were identified, with fifteen projects being granted permission to submit formal applications under 'Round 2'. In January 2010, a further nine zones were allocated to developers through a competitive application process, under 'Round 3'. On top of these, there have also been Round 2 extensions granted for certain projects, and a number of sites granted exclusivity agreements to apply for development in Scottish Territoral Waters. In 2008, the UK overtook Denmark to become the world-leader in generating energy from offshore wind (Jha, 2008). With current UK emphasis on the construction of Round 2 projects, and the early development phases of Round 2 extensions, Round 3 and Scottish Territorial Waters projects, there is the potential for thousands more turbines to be installed in the waters around the UK, with expansion also predicted for many other countries worldwide, as technology develops. As with the expansion of any relatively 'young' industry, there are concerns over the potential for environmental impacts resulting from offshore wind farms, including damage to the seabed from the installation of the turbines, and from the temporary placement of jack-up vessels, generally used in the construction of offshore wind farms. Of the four phases of an offshore wind farm (exploration, construction, operation and decommissioning), it is generally considered that for marine life, the construction period has the greatest potential for causing impacts. It is inevitable that the installation of a foundation and tower (currently up to around 6m in diameter) will cause the removal of an area of the receiving seabed as available habitat for infaunal and epifaunal species (animals living in and on the seabed). For immobile species, this can also result in mortality, either through the impact itself, or the noise from the piling hammer, if the foundations are to be driven into the seabed. The potential impacts arising from the various phases of the project are illustrated in Figure 1, taken from Elliott (2002). These diagrams are not exhaustive, but give a good indication of the intricacies of the impacts which may be caused by the installation of an offshore wind farm. It should be noted that the impacts demonstrated in Figure 1 are heavily weighted towards marine life, i.e. 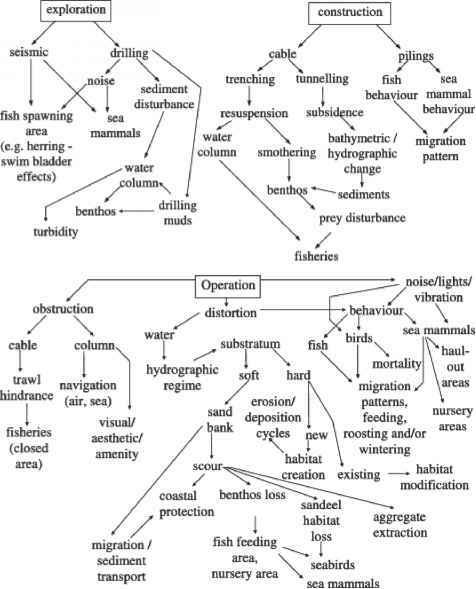 benthic fauna, fish and marine mammals. Other impacts include potential impacts on bird populations (more complex than demonstrated here), as well as socioeconomic issues, such as changes in levels of tourism in an area, and possibilities for job opportunities. As with any developing industry, focus has been on the potentially negative impacts on the environment, so that these can be reduced, and where possible, eliminated. In this light, one element of offshore wind farms which has yet to be fully investigated and acknowledged at a wider level, is the potential for the submerged towers and foundations of the turbines to act as artificial reefs, with the capacity to increase the abundance and diversity of species and habitats within the receiving environment. • Artificial reefs in the marine environment: Almost any structure in the marine environment has the potential to be colonised by marine life, thereby acting as an artificial reef, whether intended for the purpose or not. As the issue of marine conservation grows in importance, the installation of structures specifically for the purpose of enhancing abundance and diversity has increased, along with the body of work into rates of colonisation and suitability of various materials for the purpose. • Current evidence for offshore wind farms acting as artificial reefs: Although there is still a relatively low number of fully-constructed and operational offshore wind farms around the world, there are a number of studies which have looked at the way in which marine life interacts with the turbines and their associated scour protection, where deployed. This includes post-construction surveys, as required in the conditions of consent, as well as scientific studies, looking to further knowledge on potential impacts and benefits. 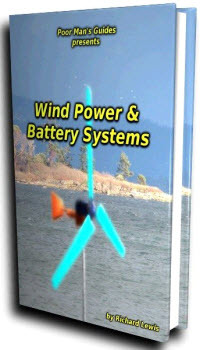 • Potential habitat enhancement by offshore wind farms: Once more is understood about the interactions between offshore wind turbines, any associated scour protection, and the marine environment into which they are installed, it may be feasible to adapt design or deployment methods in order to maximise the benefit to the environment. Fig. 1. Environmental impacts of offshore wind farms during pre-installation exploration, construction (similar effects are likely to occur during decommissioning) and operation (adapted from Elliott, 2002). Finally, areas of future study requirements will also be addressed. As with almost all areas of study, the potential for habitat creation around offshore wind farms will benefit greatly from additional work in the field. With more developments planned, more surveys around operational wind farms will determine the significance of habitats created around the turbines, as well as assisting in possible modifications to future designs, construction plans or survey methodologies. Further work on artificial reef deployment in general will also add to understanding.